SOCCEROO defender Michael Zullo wants to set the record straight ahead of tonight's crucial World Cup qualifier against Oman at ANZ Stadium. The 24-year-old says he is not unhappy at Dutch side FC Utrecht, Socceroos boss Holger Osieck is an outstanding coach, and Oman is a good football side. The Socceroos, ranked 39th in the world, have struggled in recent matches against the 105th-ranked Middle Eastern outfit, held to a 0-all draw in Muscat in June last year, after suffering a 1-0 loss at the same venue in November, 2011. 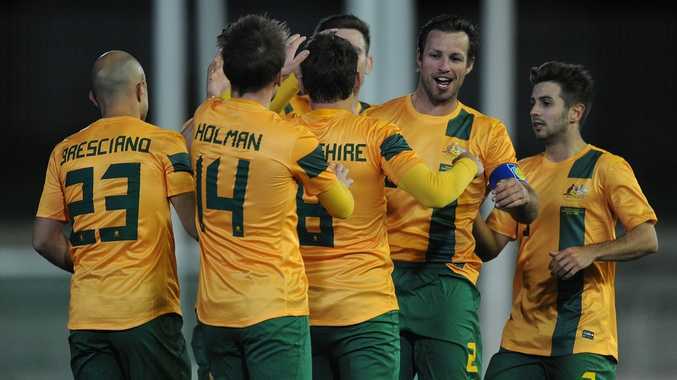 The Aussies managed their only qualifying victory against Oman in October that same year, winning 3-0 in Sydney. "Everyone thinks Oman isn't strong, but they are very difficult to break down, as most Asian teams are," Zullo said. "We don't just want to play long balls - we want to pull them apart with passing and quick ball movement." "We did beat them 3-0 last time we played them at home, then we had to play them in terribly difficult circumstances where the heat was crazy." The Brisbane Roar defender said critics of Osieck, many of whom have called for Victory coach Ange Postecoglou to be given the top job at the Socceroos, were ill-informed. "Holger's one of the best coaches I've had, if not the best at managing a team," Zullo said. "He keeps every player happy, even if you aren't getting much game time. "Tactically he's very stong too, like every coach at international level." Zullo said he was unsure how much game time he would get tonight. He also said while his situation at Utrecht had improved since the new year, his future was still up in the air. Australia's future in the 2014 World Cup in Brazil is also precarious. Japan is a runaway leader in the group on 13 points - Australia, Oman and Iraq are tied for second on five points with Jordan one further back in last place. With the top two teams to progress, victory tonight would give the Socceroos some breathing space with games against Japan (away), Jordan (home) and Iraq (home) remaining.